MERRY giáng sinh. . Wallpaper and background images in the Nhím Shadow club. This Nhím Shadow photo might contain bó hoa, phần trên áo đàn bà, bó hoa thơm, bouquet, corsage, posy, and nosegay. YAY! 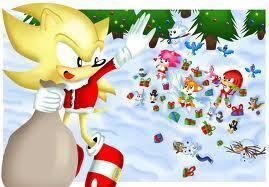 IT'S SUPER SONIC CLAUSE!!!! sonic is santa clause this christmas? YAYYYY!! !